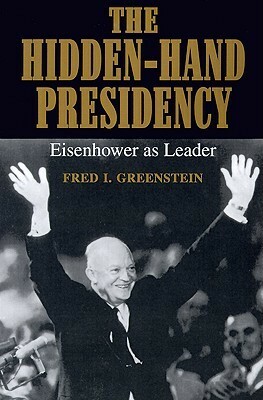 “The Hidden-Hand Presidency: Eisenhower as Leader” by Fred Greenstein was published in 1982, just two decades after Eisenhower departed the White House. Greenstein is Professor of Politics Emeritus at Princeton University and the author of several books about politics and the presidency. His most recent book, “Inventing the Job of President: Leadership Style from George Washington to Andrew Jackson,” was published in 2009. Apparent from its title, Greenstein’s book is not a comprehensive birth-to-death biography of Dwight Eisenhower. But, first impressions aside, neither is it a comprehensive review of his presidency. Instead, this is a 248 page analysis of Eisenhower’s leadership style and, at times, almost a character study. Greenstein begins by examining the contradiction of the two roles which American presidents are asked to fill: chief of state (a “symbol of unity” representing the nation as a whole) and the country’s senior-most political executive, which he compares to serving as a prime minister. In the ensuing five chapters Greenstein explores Eisenhower’s leadership style and his effectiveness in the presidency – always mindful of his “mode of leadership” rather than the merits of his policy goals. Greenstein’s analysis of Eisenhower’s leadership style (which considers how he used his Cabinet, Congress, his advisers and others who surrounded him) is nicely organized and remarkably persuasive. While the book reads more like a sober doctoral dissertation than a colorful McCullough-style narrative it is crisp, eminently comprehensible, extremely well-argued and often quite engaging. A thorough understanding of Eisenhower’s presidency is helpful – but not absolutely necessary – in order to absorb the the book’s most valuable leadership-oriented insights. And although it provides some background into Eisenhower’s pre-presidency, readers new to Eisenhower and his era will not fully appreciate the significance of many of the book’s observations. Given its age, the book’s final chapter (“Lessons For Other Presidents”) exploring how Eisenhower’s leadership style might apply to future presidents (and their presidencies) feels a bit dated. Updating the book for the thirty-five years which have elapsed since its publication (during Reagan’s first term) would be enormously valuable. Nonetheless, much of the book’s wisdom transcends chronological borders. Overall, Fred Greenstein’s “The Hidden-Hand Presidency: Eisenhower as Leader,” while not a comprehensive biography or even a thorough review of presidency, is a fascinating early look at Dwight Eisenhower’s leadership style and evolving legacy. Although it cannot take the place of a traditional biography, it provides insight and wisdom which makes this a compelling second or third book to read on the thirty-fourth president.